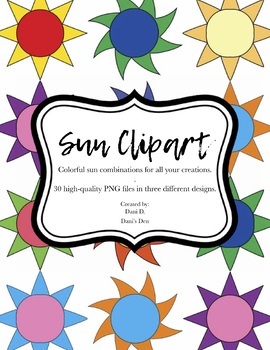 This is a group of three types of sun in different cheerful color combinations. There is a black and white version of each design for coloring. The 30 sun images are PNG files in 300 dpi and are contained in a zip file. The images are on a transparent background and are perfect for creating bulletin boards, handouts, art projects, posters, flashcard, pintables and more. These are intended for personal use in your classroom and for school-related projects.